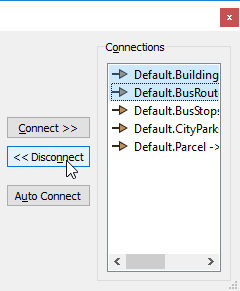 The Feature Type Connections window lets you quickly connect numerous transformers to a single input, without having to manually connect them. This feature is good for mass connections and disconnections – for example, if you have many input feature types and you want to connect them all to a single output feature type. 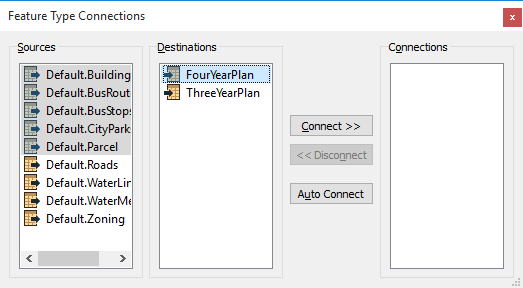 To open the Feature Type Connections pane, select View > Windows > Feature Type Connections. Follow the instructions in the example below. 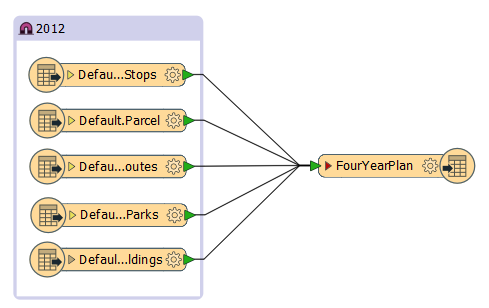 In the Feature Type Connections window, under Sources, select the input feature types you want to connect (Shift+click to select multiple lines at one time, or Ctrl+click to select individual sources). Under Destinations, select the destination feature type to which you want to connect the source feature types. 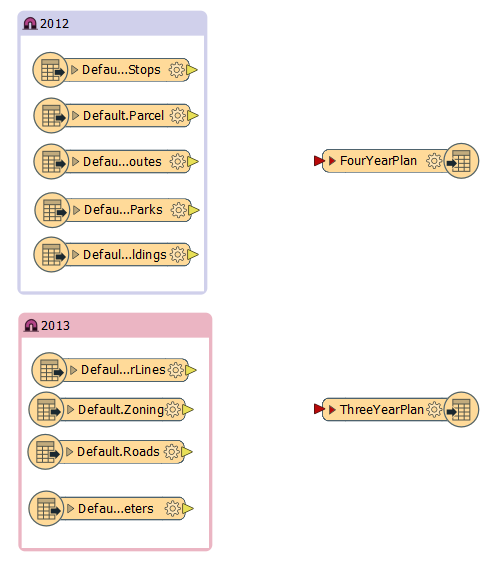 Note: Auto Connect is useful if there is a clear relationship between reader and writer feature types (for example, they have the same name). To disconnect, select connections and click Disconnect. To quickly delete connections from the workspace: Click directly on one connection and press the Delete key, or hold down the Ctrl key and click numerous connections. To quickly select many connections, hold down the left mouse key, drag the cursor around an area, release the mouse button, and press the Delete key. Tip: Undock the pane from the Workbench interface either by selecting Float from the menu in the top right corner, or by holding down the Ctrl key and dragging the left side of the pane out of the docking area. If you keep pressing the Ctrl key, the pane will not redock no matter where you place it. If you don’t press the Ctrl key while you’re dragging it, it will redock anywhere in the Workbench interface.